The better intelligence you have at your disposal, the more effectively your business can engage with clients and prepare for shifts in your industry. With this in mind, HootSuite and Brandwatch are partnering to offer customers a comprehensive engagement and social intelligence solution to manage social media across the enterprise. To learn more about HootSuite’s partnership with Brandwatch, watch their webinar titled, “Scaling for Social Business Success: Combining Social Intelligence & Engagement” with Kevin Zellmer, HootSuite’s Global Director of Enterprise Business Development, and Sebastian Hempstead, Brandwatch’s Executive Vice President of North America. Your brand and reputation are the subject of constant discussion on social media and the wider web. For this reason, your team should always be listening and responding on multiple levels, in real time, to ensure you stay ahead of the cycle of public feedback. The unique data gathering capabilities of Brandwatch filter through content from social networks, blogs, news sites, forums and other sources so you don’t have to. 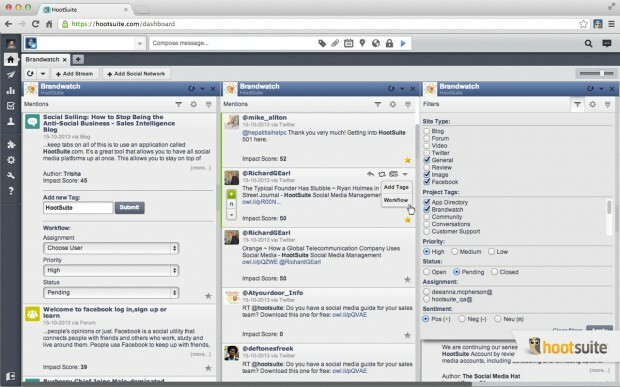 Strengthen your social capabilities with the power of engagement and social intelligence across the web with the Brandwatch integration in HootSuite. Filter your Brandwatch search queries by language, source, sentiment to create customized deep listening streams in the HootSuite dashboard. Monitor and customize Brandwatch data streams within the dashboard, then engage influencers through HootSuite’s secure publishing workflow. Continuously monitor over 70 million online sources, including social media, blogs, forums, review and news sites for mentions of your brand sentiment or other keywords. A unified interface to understand and manage social data. Uncover what people are saying about your brand, then respond strategically by publishing content to multiple channels at optimal times. 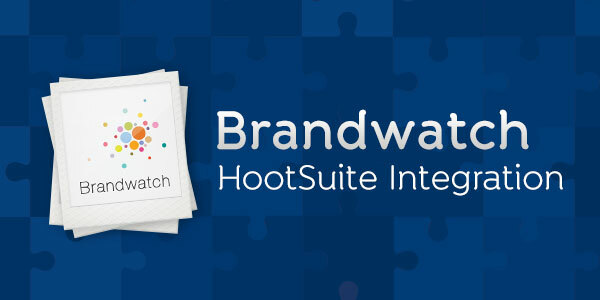 This partnership with Brandwatch extends HootSuite’s capabilities even further outside of the realm of social media, pooling often untapped resources to further enhance your intelligence gathering. By combining intelligent social gathering, social media monitoring and social engagement in a unified interface, your team can coordinate its efforts and ensure no content – and no opportunities – get lost in the noise.